"Comprehensive Summary of Academic Research on Physical Attraction"
Not a book for you to start off with when it comes to dating advice. You will find it difficult to actually implement changes in your life based on this without spending a lot of time on it. If you are at an advanced level, and you like to keep your art and knowledge up to date, this is a book you shouldn't miss. I stumbled across this book when I was reading the research papers on physical attraction. There are hundreds of research papers that have been written over the last 50 years in particular, and even more in the last 20 years. There are now a large number of scientists from different backgrounds (social psychology, evolutionary psychology, evolutionary biology etc.) interested in and furthering research in the area. What I noticed pretty quickly was that one name came up a lot more often than others. "Viren Swami". If you look at the research carried out over the last 20 years you'll see that Dr. Viren Swami has carried out a large number of the controlled studies into physical attraction and written many more articles. He has been published over 100 times on the subject in various scientific and peer reviewed journals. 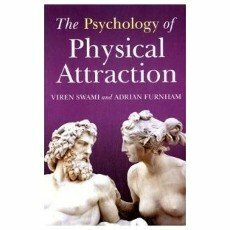 I decided that a much better approach than reading hundreds of research papers was to go straight to the source "Viren Swami", and fortunately he recently published this book with his co-author Adrian Furnham summarizing the knowledge on physical attraction research in 2007. I got it on order and was not disappointed at all. I brought myself up to date on the full breadth of academic research in the area, with what I found to be an interesting read (not as painful as reading research). It is more technical than your standard piece of dating advice, but very bearable for someone who regularly reads self-help, advice and similar genre books. Swami takes you through the implications and conclusions from his educated perspective of all of the academic research up to 2007 (which is virtually all of it). It's a huge feat, that he does well. To give you an idea, there are over 40 pages of references to research studies at the back of the book. Fortunately, the book is written from an inter-disciplinary approach meaning that the differing perspectives are explained with an evaluation of their biases. The authors don't give you the 'evolutionary psychology' view and leave it at that. They look at each, and research from each of the 'scientific camps' and the evidence to date, and give you reasonable conclusions from the combination of these views. Anyone who considers themselves at advanced level and wants to stay on top of their game and really understand what is 'proven' and what is still up for debate in the academic world should read this. Does your body shape and fitness make a big impact with women? How much of a challenge is being bald when it comes to attraction? Is the bearded look a good way to go? How important is the tone of your skin to your attractiveness? How does your physical appearance affect other areas of your life? Such as your career? Simply put: It cuts through a lot of the conjecture you'll read elsewhere with hard proven facts. Or at least it gives you an idea of how reliable the information is, as Mr. Viren Swami is very rigourous in his appraisal of the research thanks to his inter-disciplinary unbiased approach to it all. No one is perfect, and this book also illustrates why we shouldn't believe everything academics and scientists without considering it critically. They have their biases, and more importantly they have their own gaps in knowledge. As I mentioned the authors of The psychology of physical attraction appear very unbiased. On the other hand, where it came to a look into the health implications of having a body that is physically attractive there were errors based on gaps in the authors' areas of understanding. It was really interesting to see where academia had researched and proven some of the things that dating coaches have discovered through experience and experimentation. There are many areas where the dating coaches are 'ahead' of academia, and in a sense this is often true. The academic world tends to lagg the companies and people experimenting with new ideas who are free of the burden of rigourous research. But what academics do finally tend to give us, is the last word. Once their studies have proven without a doubt a concept or idea, it becomes far more reliabe. When you read this book don't expect to learn the most innovative and cutting edge thinking into how to attract women or make yourself more attractive. For advanced readers like myself, it gave me many ideas however. New ways of looking at things, and in areas where I wasn't 100% sure perhaps, it gave me an even harder conviction of my ideas. Reading this book shows how academia and the experimenters have much to learn from each other. I would love to see them work more closely together, as they are doing in some areas of scientific research in the world. Why not dating and attraction also? Unless you are very analytical and come from that kind of background (e.g. analysts, management consultants, researchers in academia) this isn't a book for you to start off with when it comes to dating advice. You will find it difficult to actually implement changes in your life based on this without spending a lot of time on it. So for newbies and beginners to dating advice, I advise you not to start here. Start with something that you can implement and get results from in our beginners section instead. If you are at an advanced level, however, and you like to keep your art and knowledge up to date, this is a book you shouldn't miss.